Now that the dust is settling on the North Carolina 2018 mid-terms (I can't speak for other states), we can begin to analyze and dig deeper into the data of voters who showed up to cast ballots, once that information is released by the counties to the NC State Board of Elections. It will likely be posted into the "voter history" data file, found here, and I'll work to slice out the 2018 voters and merge it with the voter registration file. Yet there is some analysis beginning to show about the results of the Old North State's elections and what it might mean. 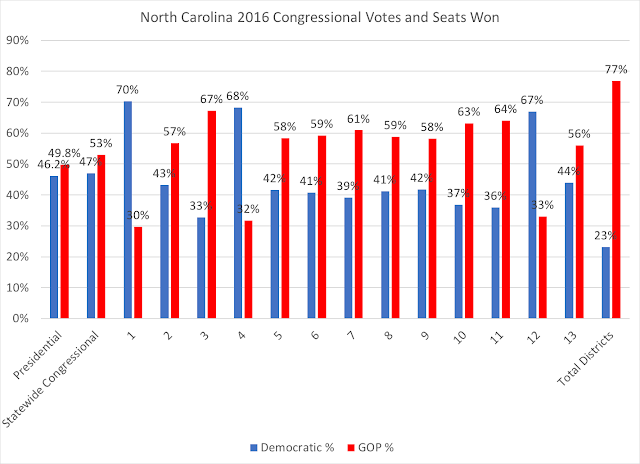 One that caught my eye was over at LongLeaf Politics blog, about the issue of Democrats "winning" more votes yet not gaining a proportional representation in either the U.S. House or in the state legislature. "tend to live in big cities. Rural areas are reliably red. Geographically, rural areas are simply much larger. So in most any way you draw districts, Democrats tend to pack together." 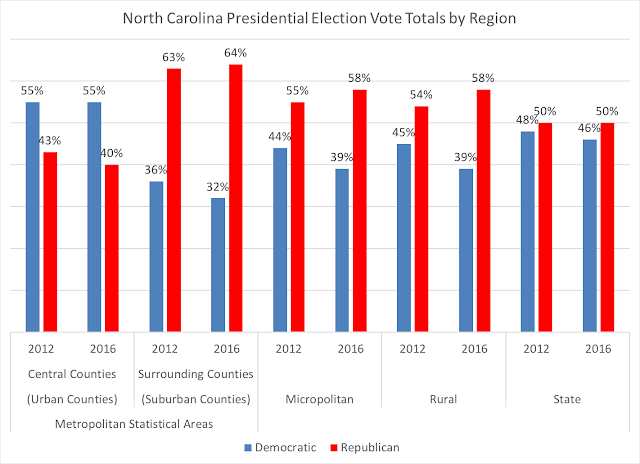 Yes, urban areas (i.e., "big cities") are trending more Democratic, and in North Carolina, urban counties are noticeably blue in elections (and some are becoming bluer with each election). But how do we know that Democrats are "packed" together in urban areas: is it 50 percent of all Democrats are concentrated in urban areas? Are there few, if any, Democrats out in the ruby red rural counties? What about the supposed 'battleground' suburbs (which, in the Old North State's surrounding suburban counties, aren't really that competitive, as noted above)--are Democrats suburbanite voters, or are they all just big city dwellers? Everyone likes to wave around generalizations to support their conclusions, but sometimes, little data is actually given to show the trends and patterns in making assertions about politics. 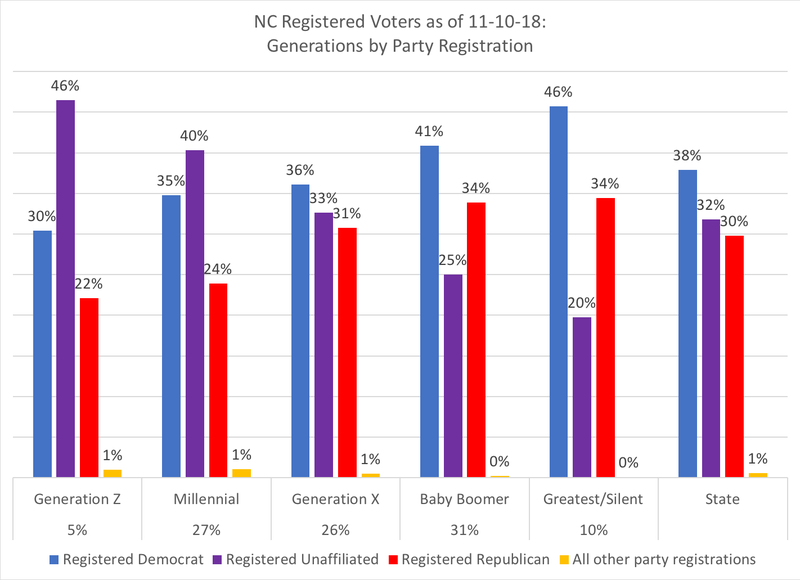 So, in looking at younger voters, who are as partisan in their voting behavior as older voters, it could be problematic in using only voter registration status. 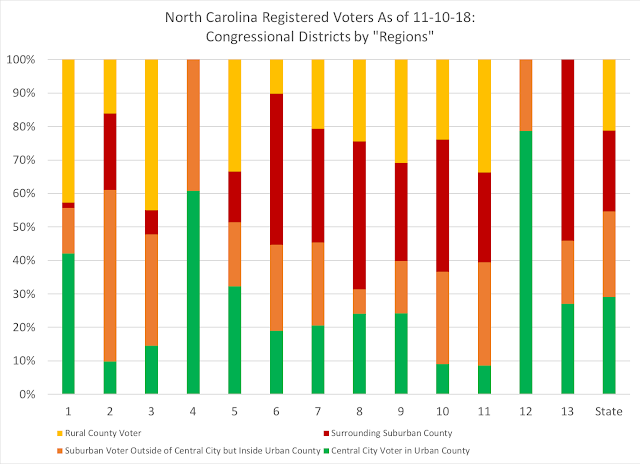 There may be ways to use both voter registration status and perhaps a precinct's voting behavior to combine together and come up with general assumptions about the voters living in those areas, but that's for another research project and post. 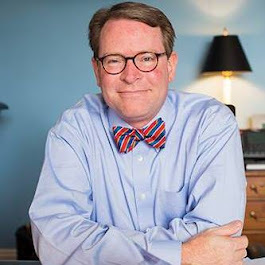 A second issue is the legacy of southern conservative Democrats, who are likely: older (Baby Boomer or older), white, and rural county residents. 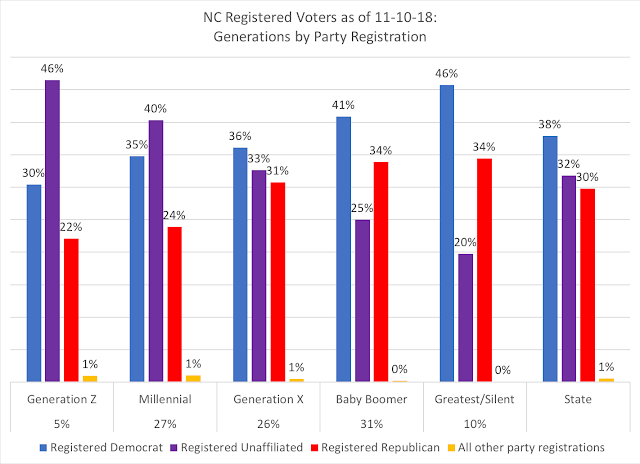 These 'registered Democrats' are more likely Republican voters, but who haven't changed their voter registration status; using the categories of white, Baby Boomer and older, and rural county residents, there are over half-a-million registered NC voters that fit that category. Now, I'm not saying that all of these registered older white rural Democrats are Republicans, but they are a safe bet. 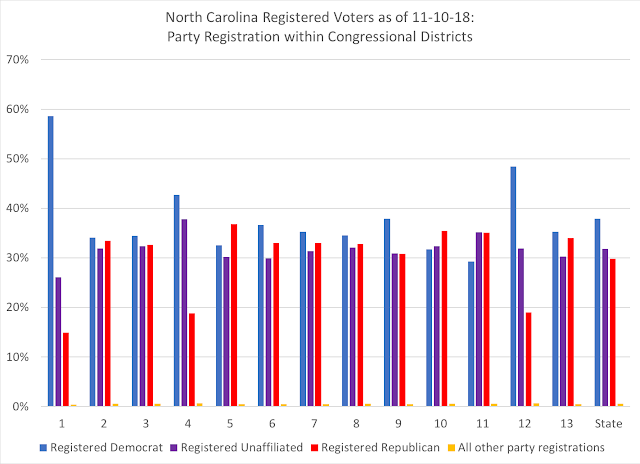 So, there's an issue with the data that I'm acknowledging before I get into the analysis, but one can look at the 7 million plus registered NC voters for any types of 'trends' of where one registered party resides, to go back to Andrew's point about (using an old real estate adage) "location, location, location" of voters. So, registered Democrats have a plurality of their registered voters in a central city/urban county, while registered Republicans have a plurality in surrounding suburban counties. So, are registered Democrats concentrated in central cities? Almost 4 in 10 registered Democrats live in a central city, whereas a little over one-third of registered Republicans are in surrounding suburban counties. One can make your own judgement as to what this data tells you about where Democrats and Republicans live. But what about each of the thirteen congressional districts in the Old North State? First, here's a look at the party registration within each congressional district. The heavy Democratic congressional districts--the first, fourth, and twelfth--have 58 percent, 42 percent, and 48 percent registered Democrats within the respective districts. The other ten districts, all represented by Republicans, have an average of 34.6 percent registered Democrats (32 percent to 38 percent). And then, a look at the central city/suburban/surrounding suburban/rural county percentages in each congressional district. In each of the Democratic-heavy congressional districts (the 1st, 4th, and 12th), the percentage of central city inside an urban county voters (the green bars) is 42 percent--or greater. The Republican-controlled district with the highest percentage of central city voters is the 5th, at 32 percent. In the research and literature on redistricting, there are two critical concepts that are often at the heart of the controversy of partisan gerrymandering: "cracking" and "packing." Cracking refers to the idea of taking a group of voters, perhaps located in general area, and dividing them into multiple districts, thereby diluting their voting power among the several districts. Packing refers to the idea that a group of voters, instead of being spread between districts, are packed into one district (or more), thereby giving them supermajority control, but isolating them into a few districts. 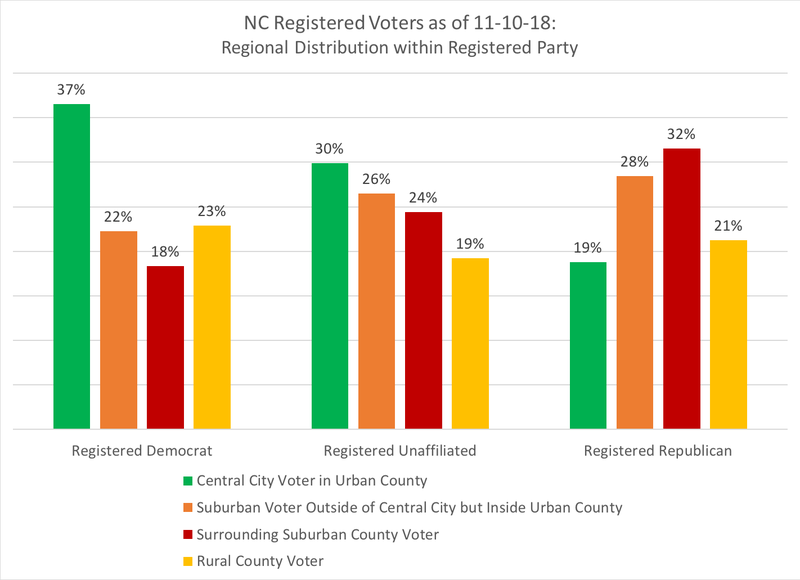 So, if 37 percent of state's registered Democrats are located in central cities inside urban counties, but three districts have higher percentages than the state-wide average (42 percent in the 1st, 61 percent in the 4th, and 79 percent in the 12th), have Democrats been "packed" into districts to isolate them from the other districts? To return back to an earlier adage, "location, location, location" matters, and in particular, location matters in terms of voters and voting patterns. 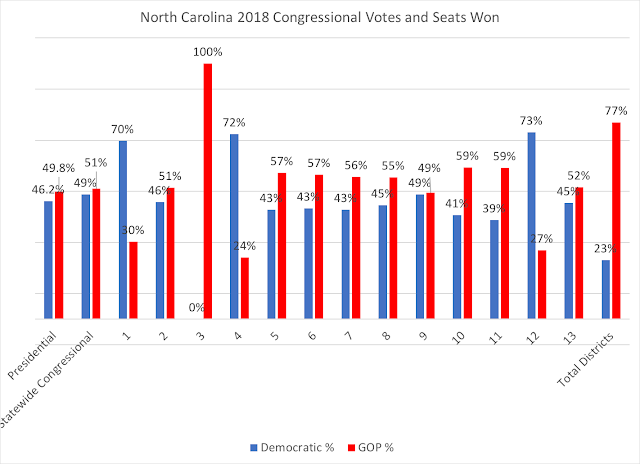 And in looking at the still unofficial returns for each congressional district, one can see a pattern when it comes to 2016's voters and 2018's voters showing up in each congressional district. While Republicans contended in their map-making that one of their goals was to include 'urban areas' into each congressional district, Asheville was formerly in the 11th Congressional District, but was moved into the very safe Republican 10th that could 'absorb' those Democratic voters, thereby leaving the 11th much more Republican than it was formerly (a Democrat had represented that district before 2010). To simply say that Democrats live in one area and ignore the impact of the district lines belies the fact of how precise and articulate a congressional redistricting scheme can be to benefit one party over the other. 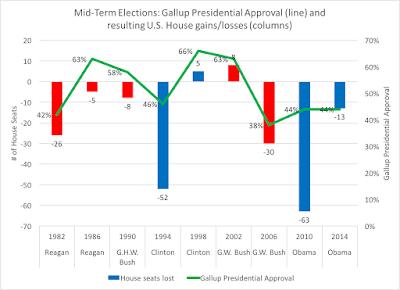 The other factor: we as voters have been partisan loyalists, and as I show in this post, how one votes at the top of the ballot dictates a lot of the explanatory power of why certain candidates win down the ballot. Democrats originally drew that district to create another minority district to satisfy the Voting Rights Act and carve themselves out another seat. Yes, North Carolina Democrats drew that district to create a second minority-majority district in the 1990s, at the direction of George H.W. Bush's (Republican) Department of Justice. Black Democrats and white Republicans were very happy to have black Democrats drawn into two majority-minority districts (the 1st and the 12th): African-American voters could then elect one of their own to represent them, while Republicans would be left surrounding and have the other remaining districts as prime opportunities for themselves. The ones who were not happy about this Republican DOJ directive: white Democrats, who knew putting black voters into one district would lessen the surrounding areas and leave them for Republicans to pick up. The above quote makes it out that all Democrats were happy to satisfy the VRA (at the behest of a Republican D.O.J.) and carve themselves out another seat, but it wasn't the case that all Democrats were happy. I would recommend Dr. Charles Bullock's (who I studied under at UGA) book on Redistricting: The Most Political Activity in America as a valuable resource on this topic. 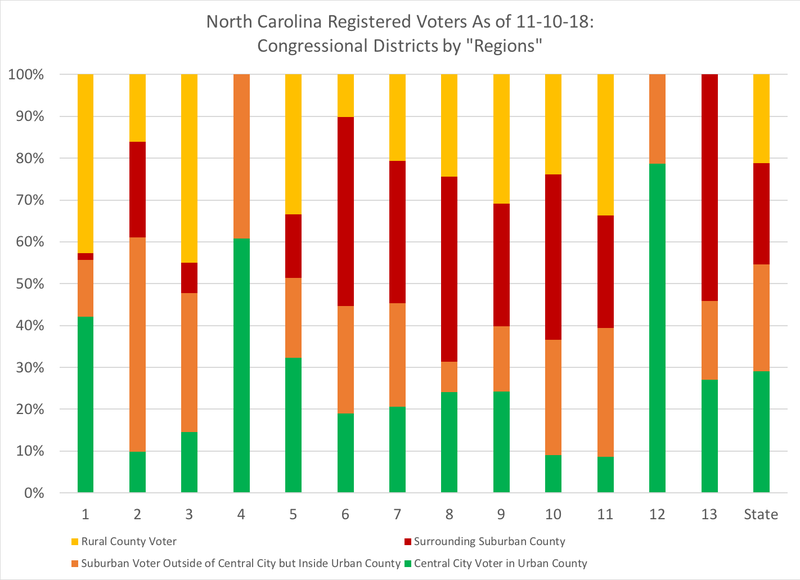 So, while some may argue that "location matters" when it comes to elections in legislative districts, it's also the fact that "lines matter" when dividing those locations into districts, and thus creating winners and losers. To make one final point: having a congressional district map reflect a 'pure' proportional representation of a state's partisan vote is, as I tell my students, living in theory-land, but here in reality world, politics is a game about power, and whoever has their players show up for the game gets to write the rules of the game. And that's what redistricting is: writing (or in the case of redistricting, drawing) the rules of the game that players have to play in. But recognize that even in a substantial year for Democrats, the outcome of the game really didn't change that much. So the rules worked; and some have challenged those rules as violating other fundamental rules. We'll have to wait and see how the game, and which set of 'rules,' ultimately plays out.